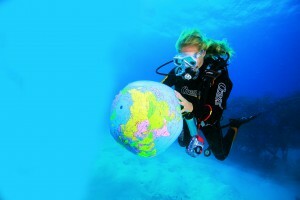 The London School of Diving is the capital’s premier PADI dive school. We are a PADI 5* Career Development Centre and conduct all PADI scuba diving courses from Try Dives, initial Open Water to Instructor level courses. We have our own on-site purpose built heated pool. We pride ourselves on the standard of excellence we set and the exceptional service we provide. Below we will describe our courses and experiences to help you choose what is best for you. Whether it is taking your first breaths underwater on our Try Diving experiences, to getting the world renowned PADI Open Water Diver certificate or moving up the ranks to becoming a dive professional we have it all. LSD has some of the most highly qualified instructors in the country with one of the most relaxed and fun environments to begin or continue your training. Begin your journey today. If you have never tried Scuba Diving before, then why not join us at our Dive Center in Chiswick for your first breathes under water. The PADI Open Water Diver Course is your first license which allows you to dive anywhere in the world down to 18 meters. Dive a little deeper with our PADI Advanced Course, learn invaluable lifesaving skills with the PADI Rescue Diver. Or add some strings to your bow by taking some PADI Specialties. If it has been a while since you last dived and need a little practice before your next holiday. Then the LSD Scuba Review program is the perfect way to do this at our centre in Chiswick. We are one of the most active dive clubs in London and we are always on the lookout for new members. Become a PADI Professional with the Divemaster course, or Live the dream and teach anywhere in the world with the PADI Open Water Scuba Instructor license. At London School of Diving we offer high quality scuba instruction from entry level course through to instructor level training. We pride ourselves on the standard of excellence we set and the exceptional service we provide. Training is carried out in our custom built dive training facility. This includes our on-site heated dive training pool and state of the art classroom facilities. PADI, the Professional Association of Diving Instructors, is the world’s largest and most popular diver training organization. It has instructors and facilities in more than 200 countries and territories across the world. 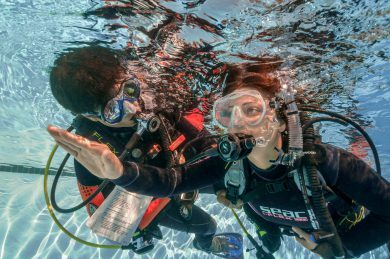 As a PADI 5 Star CDC Centre our instructors are highly trained professionals and we have won awards for education, community involvement and environmental projects. For those wishing to visit some more exotic dive locations we run regular holidays conducted by our senior instructors. Here you can further your dive education, or simply relax and enjoy some of the world’s finest diving. We have an extensive range of modern, well maintained equipment available for hire at competitive rates and can offer excellent deals on all diving equipment through Mike’s, the UK’s largest diving retailer. Please feel free to contact us with any queries or pop in and see us for a coffee and a chat. As always, fantastic team and great diving at London School of Diving. Scuba Review completed for myself and Dad after a long time out of the water- younger brother completed Open Water part A. Really chilled atmosphere, relaxing and great fun- professional instructors who make the day a really good one!! Thanks LSD. Did my Open Water here in 2017 and a refresher course very recently (Mar 19). Staff were friendly and engaging and I had a great time learning the basics again. Highly recommend this outfit. I have to say our diving class with the fabulous Amy was way more fun than I'd anticipated. Amy has a great way of putting you at ease while being very clear with the technical information she's giving. I couldn't fault any of it; I learned loads and am now looking forward to completing the open water referral in the spring. Im a 15 year old boy and it was amazing I was quite nervous when arriving but when we finished the briefing it made feel completely comfortable and when we entered the water I had no nerves whatsoever. Andy was a great instructor and it was an amazing experience I definitely recommend it. Great fun. Good facilities and our instructor, Andy, was brilliant. Would and have already recommend to friends. Great time in the pool as well as in the lake. Did my open water certification here. Good and easy going instructors. Also did the dry suit specialty at the same time, quite a must when diving in murky and cold British waters! Very happy to have found such a great diving school and club so close to home. Had a great EFR Refresher and looking forward to training with them to be an instructor. I had a really bad experience with another dive club and almost gave up diivng but wanted to try one more time so went with LSD, and have been with them ever since, they are fantastic. They are helpful and really care about what is best for you. 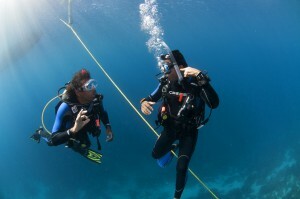 Brilliant dive centre offering courses of all levels. I've now done a couple of courses there and have already signed up for my next one. The staff are friendly and knowledgeable. I would recommend to anyone, from beginners to instructors. (Drysuit Diver) Good course with friendly instructors. During the course we faced a range of issues at no fault of the dive centre, the instructors dealt with these in an effective and freindly manner, and we had a good day overall; espcially considering the water temperature was 3 degrees! I took my 13-year-old son here because a friend gave him the "Discover Scuba Diving" intro course as a birthday present. Our dive master Samantha was fantastically friendly, calm, knowledgable and made the whole session feel incredibly relaxed. It was a great experience, and I would definitely recommend London School of Diving if you've never tried scuba diving and would like to give it a shot in safe and controlled surroundings. Brilliant fun. Great school, great instructors and fab facilities! Andy was fantastic bringing us through our Open Water Referrals. Highly recommend for PADI courses! Completed both Part A and B open water diver with LSD. Had a great experience. Fun and professional teachers and ensured we were at ease the whole time as well as keeping a watchful eye on us. Would highly recommend courses with them. I chose to do my PADI Open Water course with LSD based on recommendation and am glad to be contributing with another great review. The staff in general are friendly and quick to respond with any queries. Dilara Wilkins trained me in both Part A and B pool/lake dives. 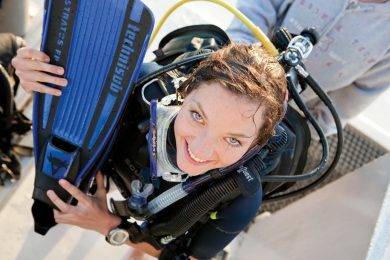 Her passion for the dive was infectious and her teaching methods direct and fun. Andy joined us for the lake dives and both instructors were extremely skilled and accommodating with the varied levels of new divers. For most, starting diving is like learning a new language but the instructors delivered the information in such a clear manner that it was quick to begin confidently putting your new-found knowledge to practice. Thanks again for welcoming me into the diving world! Recently did my open water referral. Couldn’t have asked for better training. It was clear and easy to understand and moved at the pace that suited myself and another student. Very professional but enjoyable. Highly recommended. I had such a great time learning to dive with LSD! The instructors are fun & helpful and, even though the visibility was shocking in lake, it was a fantastic experience. Thanks team! 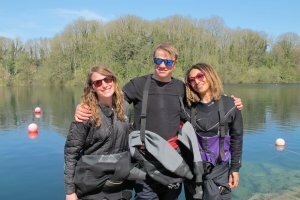 My partner and I had a fantastic time doing our open water referral and completion with LSD - they were extremely thorough in their teaching, made everyone feel relaxed and also made it fun. Class sizes are small and there is more than one teacher so its almost 1-2-1, and everything was organised very well. Facilities were good, and the lake was only a 20 minute drive from the centre, so it was all very convenient as well. Shout out to Cat and Geoff for being great teachers, but also to Elle, Jake and Gary! Thank you guys! Me and 2 other members of the family were keen to do the open water certification to make the most of the scuba world out there. We were greeted by Cat, a fantastic instructor who made our confined water dive incredibly enjoyable. She was patient, helped us learn the key skills efficiently in a way we'll never forget them. We are all now booked on to do our open water qualifying dives next week and are very excited! Would thoroughly recommend the London School of Diving! Myself, my husband and our 2 children aged 12 and 14 carried out a scuba diving taster lesson last night. We had such fun. The staff were so friendly and very professional. A great experience! Passed my Open Water. Thanks to Kat, Evans and Andy, this was great and smooth. For the Open Water, they provide transport if you can meet them at their office to Wraysbury. Thanks again, highly recommended. I had a voucher that was about to expire, and was slightly worried that at the short notice I wouldn't be able to dive at all, but they booked us in for that week, and everything was so well organised. Our Diving instructor (who's name I am afraid I have forgotten - sorry!) was fantastic! .My cousin who came with me is 11, and also really enjoyed it, and I think plans to do her PADI in a few years! I will be back! Did my dry suit course here. The guys were really helpful getting the gear together and making everyone feel comfortable. The equipment was all top notch, fairly new. I would definitely recommend the school. Just completed my open water referral and completion with LSD. The instructors were very helpful and made sure that I felt comfortable being in the water. Definitely recommend for anyone looking to learn how to dive! Just done my ow course, from the pool sessions to the open water completion I found my instructors cheerful and knowledgeable and allowed me to learn at my own pace. Very enjoyable. I had a very positive experience learning to dive here. I am not the most naturally sporty person, but found that the instruction was comprehensive and professional, and made students feel at ease.